Ok, for those of you new to Megatokyo, and might be somewhat new to anime in general, I should supply a little additional information here regarding today's strip. "Naze Nani Megatokyo" is a spoof of "Naze nani Nadesico", a little skit that occurred several times in the animated tv series Martian Successor Nadesico. Yurika, the somewhat airheaded captain of the ship, decides to bolster the spirits of the crew by putting on a goofy show where she plays the 'silly bunny' asking questions of 'Ruri onesan' in order to educate the crew on how the ship works. That is why Largo and Piro are dressed the way they are. 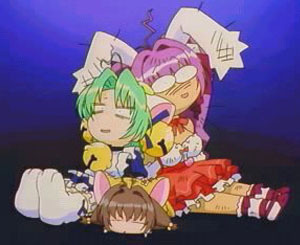 As for why Erika and Kimiko are dressed as Rabi-en-Rose and Digiko from Digi Charat... uh... i don't know why, really... it just sorta... worked... it seemed so right... and yet so wrong at the same time... ^^;;;; Ah, what a fun episode. We must do this again. The Gamespy linking has grossed us quite an increase in readership - which was kinda the whole point. :) Exposure is nice. It keeps me from chucking the whole project and catching up on some things, like Skies of Arcadia, and Final Fantasy IX, and... you get the idea. We even got emails from George Broussard and John Romero himself. ^^;; Thanks for havin a sense of humor guys. It's been interesting reading some of the opinions and comments in the forums recently. The biggest problem with having a large group of people eyeing what you do three times a week is that everything you end up doing gets scrutinized. Reactions to us working with Gamespy was greeted with both praise and horror. It really is true, you can't please everyone. There are grumblings about 'selling out' and 'we dont want MT to change'. (sigh) if you folks dont get it at this point, i'll have to send Erika in to bean y'all but good. Largo and I have one goal - to improve MT until it is the best comic / manga / production (i use that word because to me, MT could move into almost any media) that it can possibly be. The only think that keeps it down are my crappy art skills, time constraints, day job, inability to write a good story... uh, you get the idea. We started MT for fun, we shall continue to do it for fun. There will be no selling out. Only things that improve Megatokyo will happen. In honor of today being the anniversary of Pearl Harbor, I thought I'd in turn bask in the irony of the gaming industry's history and talk about one of my old coin-op favorites, 1942. Here is a classic shooter game that places you in the cockpit of a P38 as you fly thru the skies of Nippon. Sounds simple enough, get in plane, launch, and blow up as many Japanese pilots as you can. Then the irony begins to set in, this game was created by Capcom, a Japanese game company. Imagine it, a group of guys got together and made a game where the player kills their own people. Either just plain morbid, or dark comedy at its best, this entire concept just gives me the chills. I began wonder how I'd feel if I was making a shooter game where the player goes around and kills my own nation's armed forces. I could call it, 1991 - you would play as a brave Iraqi pilot charging against the air and ground, and sea forces of the vile American Imperialists! Avoiding the tomahawk missiles and stealth fighters would be the worst of the ordeals, and at the end of the game you'll have to takeout the aircraft carrier with George Bush on it. See, This is a game that will never be made, or if it was, I doubt it would sell well outside of the Persian Gulf. Oh well, when in doubt just keep telling your self, "It's only a game." Today's comic linkitage brings you deeper into the realm of the abstract. Beginning with a new comic based on geometric drawings. For the original in geometric abstract wacky-ness check out Triangle & Robert either strip is sure to make it so you never see basic shapes in the same innocent light, ever again. There seems to be some comments of MegaTokyo 'selling out' or something to that effect, I'd like to point out that in order to sell out two qualifications must exist. 1. The person must agree to compromise thier own integrity or beliefs. 2. The person must get some mad cash flow for doing it. I can assure you that we have not sold out. For one thing, I have no beliefs that I'd ever compromise, and more importantly. I've yet to get any of that mad cash flow. I mean really now, do any of you see a "PlanetLargo.com" anywhere? Now that I've said that, I'm going to plug our new friends over at gamespy, hah, see you can't stop me - I plug it again! and you'll click on that link and be entertained damnit!